If you’ve ever been a kid — and who hasn’t? — you may identify with Inside Out. If you are a parent, you may find it heartbreaking. Pixar’s latest covers that awkward time when you stop being a child and start stumbling towards the teen years. Your personality changes and no one seems to know why. Your parents don’t know why. Most importantly, most of the time, you don’t know why. And in director Pete Docter’s vision, the voices in your head don’t really know why, either. They have some idea, in that they get that they’re avatars of emotion, but they fight among themselves for control of the mental landscape that defines you. In this case, actually, it’s Riley (Kaitlyn Dias), an 11-year-old girl uprooted from a happy childhood in Minnesota to San Francisco, where her father (Kyle MacLachlan) is part of a tech start-up. Riley and her mother (Diane Lane) both try to put on brave faces, but reality keeps failing to match their dreams of what it would be like. That’s where Joy (Amy Poehler) goes into overdrive. Inside Riley’s head since birth, Joy is, well, a lot like Leslie Knope from Parks and Recreation, but with blue hair and an actual mandate for joy. With the team of Sadness (Phyllis Smith), Fear (Bill Hader), Anger (Lewis Black), and Disgust (Mindy Kaling), Joy runs the “headquarters” of Riley and wants to make sure everything stays sunny. For being the one in charge, though, she has a lot to learn about the way the human mind actually works. Though Joy cannot see the point of Sadness, the blue sad sack has started tainting the happy memories Joy worked so hard to provide. At least, that’s how Joy sees it. In reality, Riley has had a lot of upheaval, and her feeling of belonging and safety is gone. Her core memories — here visualized as golden spheres set apart from all other memories — all stem from a place that grows more and more distant. And then, they get lost deeper in Riley’s mind, with Joy and Sadness taken along for the ride. 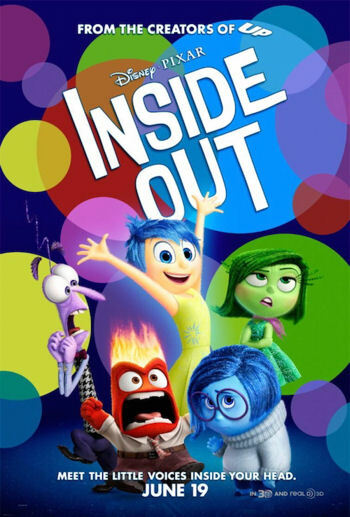 Bright and fuzzy in its visuals, Inside Out has some clever ideas to show us mental processes, though some might find them distractingly literal. 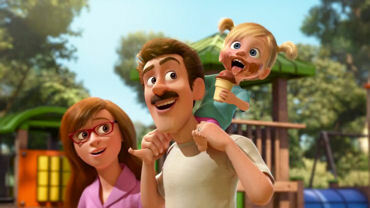 The movie embodies piece of personalities as amusement park-like islands, surrounded by towering collections of memories. To keep the mind connected, you can always catch the Train of Thought, which becomes Joy’s goal in order to get back to headquarters. Little workers toil among the towers of memories, marking some for destruction, and mischievously keeping some irritating ones in circulation. One particular memory, Riley’s childhood imaginary friend Bing Bong (Richard Kind), tries to just stay out of sight, waiting for the moment he’ll be needed again. At times it gets a little abstract for younger children, especially when the characters literally do journey through abstract thought. And there’s a darkness here, too. 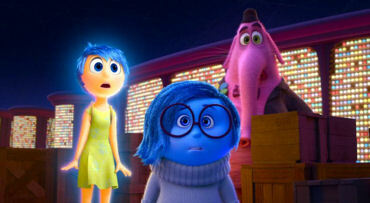 It’s no accident that the movie focuses on Sadness, and there’s a consequence to that. But that’s also classic Disney — showing that we can get through the dark times. You might think, however, that for most people, Fear, Anger, and Disgust run things a lot more often. For adults, we can remember going through it. And as parents, there’s quite a lot that’s bittersweet here. As hard as it is to lose the childishness of your child, it’s something we all have to go through. 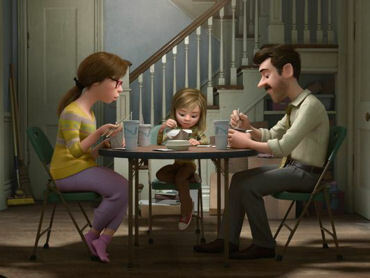 Inside Out gets that right. The movie has its flaws, but it’s reaching for something. Docter and company are trying to explain something that no one can really agree about, and maybe it is a little weird that babies would have adult homunculi inside their heads. But like you have to with a kid, it’s a playful way to talk about something deep. And if it sparks you to walk out of the theater and spend a few minutes being harmlessly goofy with your kids (no matter how old they are), or just harmlessly goofy in the privacy of your own home, that’s not a bad thing.